After a wonderful day in Albuquerque, it was time to move on. Before we left New Mexico, we stopped over at the Acoma Sky Village, where visitors can get some insight into the lives of the Acoma Pueblo tribe of Native Americans. Note the blue doorway in the photo at the top of the post, to ward off evil spirits. Our guide was very informative, taking us around the village and explaining the significance of various buildings and events in Acoma Pueblo history. Wow, that's a shame - we enjoyed our meal there. This dish was absolutely delicious. Tim and I really enjoyed our meal at Café Ole, and I am rather sad that it was a once off experience. 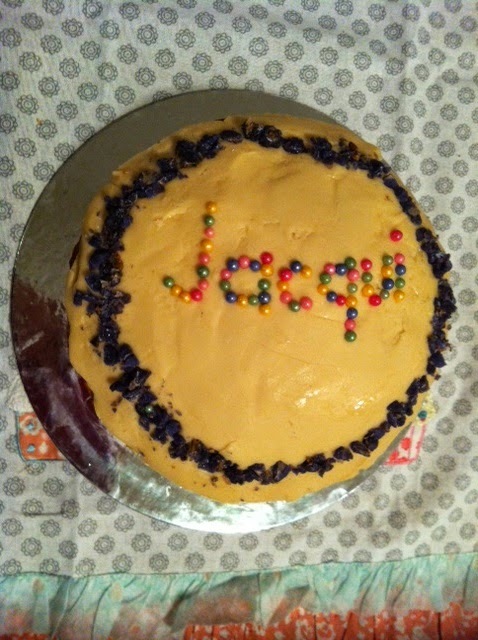 Friday was Jacqui's last day at work. 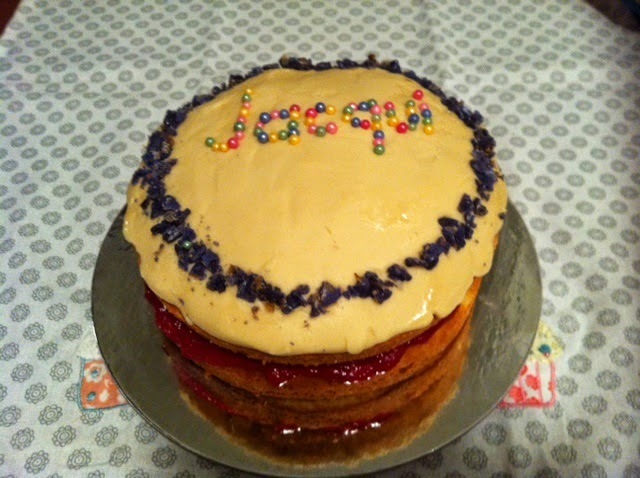 There was a morning tea being hosted in her honour, so I made a cake for the occasion. I chose to make a recipe from The Caker by Jordan Rondel, as Jacqui introduced me to this book. There are lots of tempting sounding recipes in the book, but I was really keen to try the Peanut Butter and Jelly Cake - because it sounds so delicious! 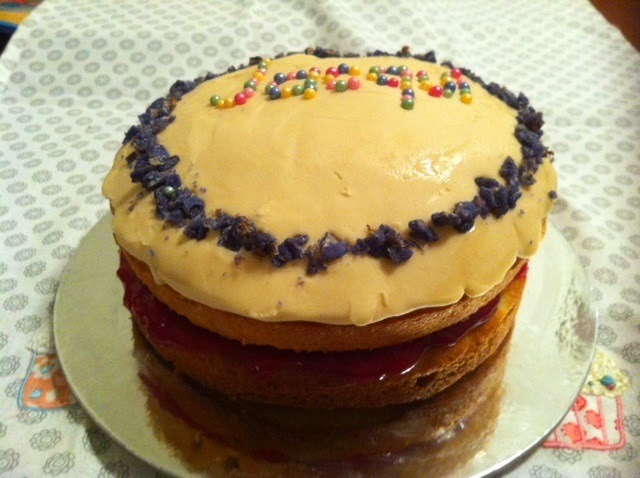 The recipe for Jordan's peanut butter and jelly cake is online here. My icing turned out weirdly solid, almost like play dough, but it tasted just fine. For decorations, instead of fresh raspberries (which are really expensive in the middle of winter), I used crystallised violets and coloured sugar pearls. The Caker is a really lovely book, so if you are a cake baker like me, it is well worth a look. Louise of Months of Edible Celebrations is hosting The Picnic Game for International Picnic Day. What is the Picnic Game? Check out Louise's post here to find out. It's not just any old jelly roll - this recipe comes from Margaret Fulton, doyenne of the Australian kitchen, from p 215 of The Margaret Fulton Cookbook. This book is the very first cookbook that I bought, 10 years ago, and is an updated version of the one that my mother received for her 21st birthday, so it is pretty special to me. Preheat your oven to 220 degrees Celsius. Grease a 30 × 25 cm jelly roll tin and line with greased baking paper. Sift the flour and salt together. Put the eggs and sugar into a heatproof bowl over a saucepan of simmering water, and whisk together for about 10 minutes or until mixture is very thick and creamy, or if using an electric mixer, until the eggs and sugar are just warm. Remove the bowl from the water and continue whisking or beating the batter with a mixer until cool. Fold the flour gently into the batter, then fold in the hot water. 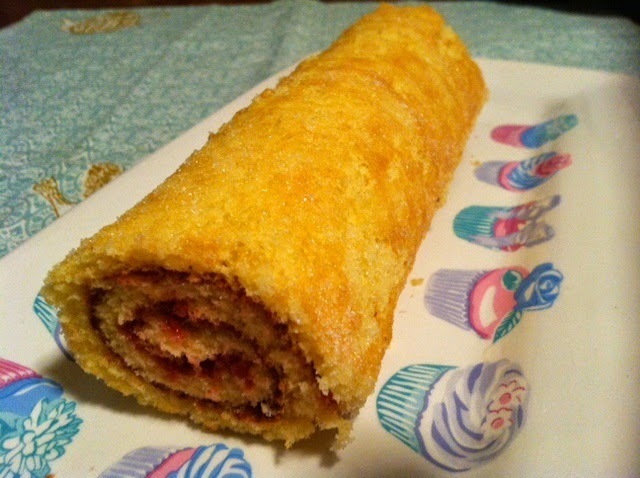 Pour the batter into the prepared jelly roll tin, and spread evenly over the base of the tin using a metal spatula. 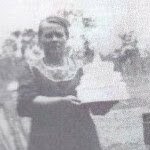 Bake the cake in the preheated oven for 7–10 minutes or until pale golden and springy. Turn the hot cake immediately onto a tea towel sprinkled with sugar. Carefully pull off the baking paper so as to avoid tearing. Cut off the crisp edges of the cake with a knife, then roll the cake up in the towel, and leave to cool. 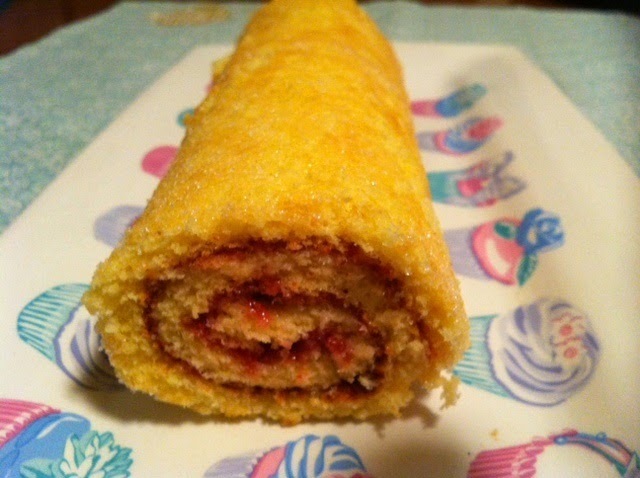 Unroll the cake, and spread it with the warmed jelly to the edges of the cake. Using the tea towel to help, roll the cake into a firm roll. Place the roll onto a wire rack with join underneath to cool. Sprinkle with more sugar before serving, if desired. Please come along to the picnic - Louise has posted the entire Picnic Game roundup here. This week's French Friday with Dorie recipe does not, at first blush, appear to be very French. It is for Guacamole with Tomatoes and Bell Peppers, which seems rather Mexican in flavour. However, we are assured by Dorie that in France, guacamole with chips is all the rage, hence the reason for this recipe appearing in her book. Do you read the cooking sections in the newspapers? I look forward to Tuesdays, the key food day in most newspapers, and to the weekend newspaper magazines, which also feature recipes. I have way more clippings and bookmarked recipes than I can ever possibly make, but that doesn't stop me from looking for my next recipe fix. 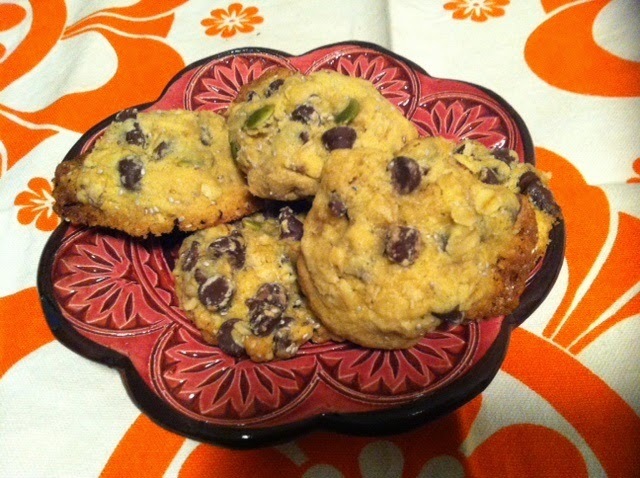 Recently, I found a recipe for Seeded Chocolate Chip Cookies by Martha Rose Shulman, of the New York Times. I was attracted to this recipe because it includes chia seeds, pumpkin seeds and rolled oats (all of which I had to hand), making them a little different from other recipes. I made the recipe as stated except that (a) I used dark chocolate chips because I was not in the mood to chop up chocolate; and (b) I used tablespoons of dough instead of teaspoons because I clearly cannot read, so I only got 18 cookies (though I doubt that I would have got 4 dozen, as the recipe suggests). I was glad that I made these - they were really good cookies, and just a little different from your usual chocolate chip cookies. I even received a verbal compliment at work for them - because I bake fairly often, this is quite rare. I would definitely make these cookies again sometime. We are going Spanish on Wednesday with Donna Hay this week, as Kayte chose Paella from p144 of Modern Classics I.
I have never made paella before, so I found it an interesting exercise. Donna's recipe calls for clams and mussels. To the credit of the Malvern fishmonger, they stocked both - but mussels cost $12.50 for a small packet, and the clams cost $31.50!!!! As I am neither a major seafood aficionado or having a dinner party, I skipped over to Woolies and bought marinara mix instead. Sure, it isn't as picturesque without those shells popping open, but it is way more wallet friendly. I made only a third of a portion of Donna's recipe, enough for me for two meals. I quite enjoyed this dish, after being initially a little dubious. I'd definitely make it again, especially as it is a much simpler paella recipe than others that I have seen. To see how Kayte, Margaret, Chaya and Sarah fared with this dish, visit their websites. I have no recollection of what type of soup this was, except that it was spicy and good. As you can see, the vegetables were a little sad, but the salmon itself was really good, and the glaze perfectly complemented it. Our Sandia Peak experience was the perfect end to a perfect day. Recently, I spotted a lovely recipe called Grape Harvest Cake on Lorraine's website. I had some grapes in the fridge and thought it would be a great way to use them up, but alas, those grapes had already gone to God. A week or so went by, and I kept thinking about that cake, so I bought some grapes this week especially to make it. Unfortunately, the grapes on top did not want to stay there, so they sank into the cake, but it really doesn't matter - it is a fabulous cake anyway. It is golden and wonderfully moist from the grapes, and would be wonderful served at room temperature, or warmed up with some icecream or custard on the side. If you have some surplus grapes to use up, or really just like fruity cakes, then this is a perfect recipe to try. Last Saturday, I went for brunch with my friend V to her part of town, North Melbourne. V chose a new to her place straight off the Internet, Hot Poppy. Hot Poppy is an unobtrusive establishment in Errol Street, conveniently located on the No. 57 tram line. The coffee at Hot Poppy is good, and wins a big tick before going on to the food that you came for. The eggs had a perfect runny yolk inside. V really liked this, but found there was so much food that she couldn't finish it - not a complaint! This was also a really good dish - I enjoyed dipping the cevapcici (European meatballs) in the runny yolk of the poached eggs. Again, the serve was very generous, although I had no problems polishing it off. The service was a little slow, but that may be because I was there for around an hour before V arrived, in which time I only ordered a coffee. However, it was friendly enough, and the interior was warm and inviting on a chilly wet morning. I know that Beatrix is dearly loved by many (it has a 5 star rating on Urban Spoon), but I wasn't particularly impressed with these goodies, and won't be trekking back to the other side of town to visit soon. This post is especially for Kayte, who wanted to see all the tea towels I picked up on my recent Route 66 trip. It is technically a scarf, but I am going to use it like a tea towel as a backdrop for photographs. I picked this up in The National Cowboy Museum in Oklahoma. I love picking up new tea towels as a backdrop for photographs, and I had fun choosing these.